As this is the first offering in our partnership, we thought we'd make it extra special: With every VIVE Pro McLaren Limited Edition purchase, customers will be entered for a chance to win a Papaya Pass: a once-in-a-lifetime McLaren F1 Team experience in Spain in 2019. *Includes rFactor 2 McLaren Edition, McLaren Garage VR Experience. One lucky winner and their special guest can win the Papaya Pass: a once-in-a-lifetime McLaren F1 Team experience in Spain, courtesy of HTC VIVE and McLaren. VIVE Pro McLaren Limited EditionBe a Part of The Legend VIVE & McLaren. Driving Innovation Forward. 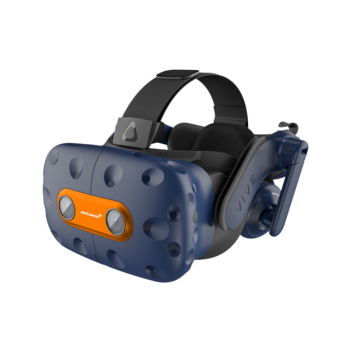 Introducing the VIVE Pro McLaren limited edition, a best-in-class virtual reality system with the iconic papaya and blue livery of one of motorsport's most storied organizations. As this is the first offering in our partnership, we thought we'd make it extra special: With every VIVE Pro McLaren Limited Edition purchase, customers will be entered for a chance to win a Papaya Pass: a once-in-a-lifetime McLaren F1 Team experience in Spain in 2019. Don't delay. As you might expect, they're going to go fast. *Includes rFactor 2 McLaren Edition, McLaren Garage VR Experience. **Exclusive 6-month VIVEPORT Subscription. One lucky winner and their special guest can win the Papaya Pass: a once-in-a-lifetime McLaren F1 Team experience in Spain, courtesy of HTC VIVE and McLaren. Processor Intel® Core™ i5-4590 or AMD FX™ 8350, equivalent or better. Operating system Windows® 7, Windows® 8.1 or later, Windows® 10 Recommended Graphics for the best experience is NVIDIA® GeForce® GTX1070/Quadro P5000 or above, or AMD Radeon™ Vega 56 or above. *driver is required to download and install before using VIVE Pro under Windows 7.